Danny (originally Bullseye) was rehomed from us as a puppy back in 2012. He was part of a litter we dubbed 'The Toy Story Litter' who were hand reared by a member of kennel staff. 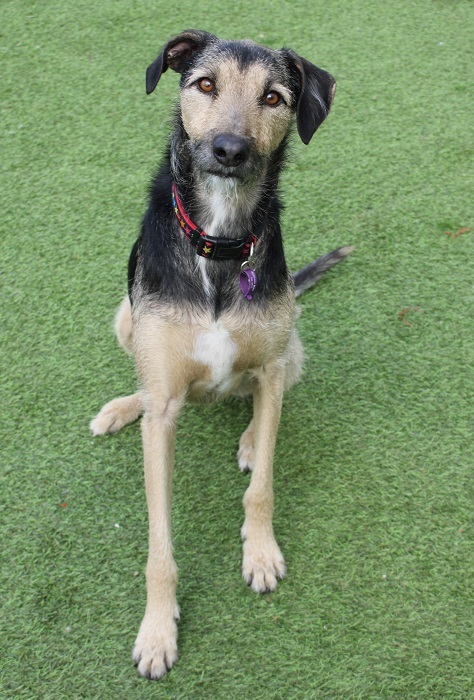 Although primarily Lurcher one of Danny's parents was a Border Terrier. Sadly Danny has found himself back with us due to food guarding which unfortunately resulted in him biting his owner when she tried to retrieve a food wrapper which he stole. Danny did drop the wrapper when asked to do so but as his owner picked it up it slipped out of her hand and as she went to grab it again Danny bit her. Danny has never had a problem guarding any other items and is fine when eating, the issues arise when something is dropped in which case it can become a competition for him to grab it before you. Danny is initially a nervous boy who takes time to trust new people, however as soon as he has made friends with you he is the sweetest boy. He is very loyal and although he often prefers his own space he will grab his blanket and bring it to you to sit next to you for a cuddle. In his previous home he was walked wearing a muzzle as like most Lurchers he can chase small animals and can also be reactive towards some dogs. Danny did have a group of dogs he regularly walked with, although he always wore a muzzle as a precaution. However we feel it is important to note that Danny has never bitten/attacked another dog and has stayed in boarding kennels where he mixed with other dogs freely in the past. He seems to be more comfortable around smaller dogs, though we do feel that he should be the only pet in his next home. He can also be alarmed by joggers and push chairs so care will need to be taken on walks. Danny will bark when the front door goes and will need to be placed in another room if a stranger visits. If it is someone he knows he is fine. Danny can become startled if he is disturbed when sleeping and may snap. Due to this he will need a quiet household with a sensible owner who will provide him with his own space. He is clean in the home, non-destructive and also happy to be left alone for a few hours. Danny has suffered with ear problems in the past, most likely due to food allergies and so he requires a hypo-allergenic diet. Danny is a sensitive boy who will need an experienced, adult only home. His new owner will ideally need to live local and be able to make several trips to and from the rescue in order to form a bond with him before adoption. This will progress into home visits to enable Danny a slow introduction into his new home. Overall Danny is a beautiful dog and we desperately hope he will find the second chance he so deserves.